Experimenta Vanishing Point, Black Box Gallery, The Arts Centre, Melbourne, 1-30 September, 2005. They say that seeing is believing but this invisible installation has us questioning whether we can trust our eyes. Picking up the swizzle stick in The Cocktail Party Effect, we can feel both a cocktail glass and hear the tinkling of the ice cubes in what appears to be an empty space. Barrass and collaborator Chris Gunn have used state of the art haptic (touch) technology to create a sense-bending work that confuses visual orientation and challenges our reliance upon sight to understand the world we live in. Revealing secrets and sharing memories from its juicy past, this is a cocktail glass with character that convinces you there’s more to the world than meets the eye. This paper describes the design and development of an interactive narrative for the ‘Experimenta Vanishing Point’ media arts exhibition in 2005. The Cocktail Party Effect tells the story of the imminent extinction of Great Apes in the wild using touch and sound in the absence of visual elements. 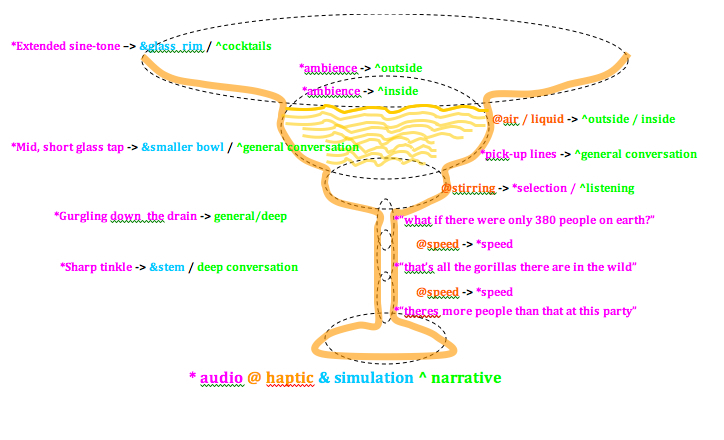 The narrative is driven by haptic-audio exploration of a virtual cocktail glass which functions as a heterodiegetic narrator, and the traversal of cut-up conversations that make up the story within. 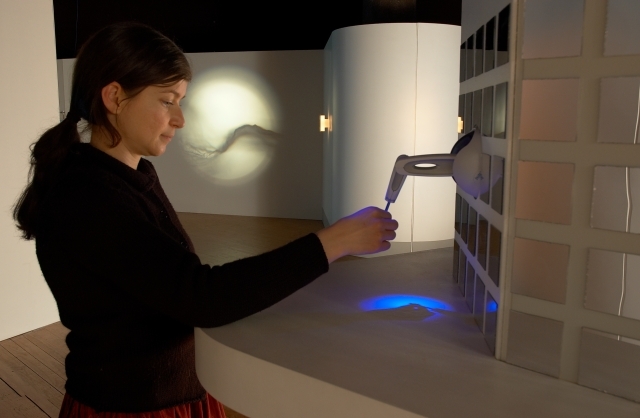 The interface was developed through a series of prototypes that explored the perception and mental imagery of a haptic-audio simulation of the invisible glass. These experiments also developed narrative functions of the haptic-audio interface beyond conventional iconic metonyms to include grammatical and dramatic special effects. Observations during the exhibition show promising narrative engagement with the piece but identify problems with the clarity of the sounds, and a conflict between the narrator and the story content.